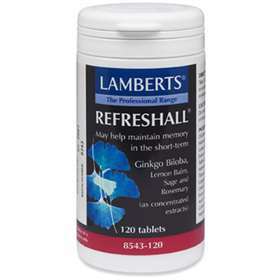 Lamberts Refreshall is a high potency product containing ginkgo, lemon balm, sage and rosemary, also well regarded as aids to healthy brain function. Ginkgo's potential as a preventative for age-related memory loss has been the focus of a great deal of research since it has been shown that it may help maintain memory in the short-term. A naturally sourced, high strength supplement. A preventative for age-related memory loss. Helps to maintain a good memory in the short term. Improves brain activity, stimulating memory. Refreshall is a high potency product that, at two tablets a day, provides the full 6000mg of Ginkgo that studies have confirmed as an effective dose. Lamberts use the same premium quality ginkgo in Refreshall as they do in their straight Ginkgo product and VeinTain. Lamberts ginkgo is of the highest quality available and Lamberts insist on a raw material that has low levels of an unwanted compound called ginkolic acid. No one else in the UK insists on this grade. Whilst ginkgo is probably the herb most associated with memory, there are several others that are also well regarded in this area including lemon balm, sage and rosemary. So in addition to ginkgo, Lamberts have added all 3 of these to Refreshall, to bring one of the most potent and relevant products onto the market. Gingko Biloba (provided by 120mg of a 50:1 extract) 6000mg, Lemon Balm (provided by 200mg of 5:1 extract) 1000mg, Sage (provided by 200mg of 5:1 extract) 1000mg, Rosemary (provided by 20mg of a 5:1 extract) 100mg. Tableted with: DiCalcium Phosphate, Cellulose, Tablet Coating (Hydroxypropyl Methylcellulose, Colours: Titanium Dioxide, Curcumin, Copper Chlorophyllin & Iron Oxide, Glycerin), Silicon Dioxide, Stearic Acid, Crosslinked Cellulose Gum, Magnesium Stearate.